In Germany, sheep breeders and cattle farmers are very concerned about the spread of bluetongue. Because of the new outbreak of bluetongue, the forbidden zone, which previously amounted to 150 kilometers, expanded to half of the territory of the Federal land. Almost entirely the forbidden zone includes districts of the Southern and Central Hessen. The only exception is a few communities in the North-Eastern part of the Vogelsberg area. In particular, they now strictly regulate the trade in ruminants such as cattle, sheep and goats. In addition, all livestock farms in these areas containing small and large cattle must be registered with the competent veterinary authority. Now veterinary services in the relevant areas and cities provide information on the size of the restriction zone, the applicable rules and exceptions. The problem means that the epidemic transmitted by mosquitoes is spreading even in the cold season. Therefore, the Minister of agriculture of Hessen Prisca Hinz urged all farmers engaged in breeding cattle and small cattle, to vaccinate animals against bluetongue serotypes BTV-8 and BTV-4. Bluetongue is one of the most dangerous infectious diseases of cows, camels and other cattle, less often goats and sheep. It got its name from one of its symptoms, "cyanotic tongue", also characterized by edema of the head, neck and chest of the animal, lesions of the skin of the hooves, necrotic secretions in the oral cavity, fever and a number of other symptoms. The virus is transmitted through insect bites. It causes a sharp decrease in milk production, infertility, and in particularly severe cases, death. The greatest activity of insect vectors falls on May-October, so the disease is often difficult to identify. The disease is incurable, it is recommended to detect antibodies with the help of enzyme immunoassay for prevention. BBC Good Food magazine writes that sausages, meatballs and ready-made goat dishes will soon appear in the American stores. According to the publication, goat meat can become one of the main food trends in 2019. The report says that the young goat meat is tender and soft, like lamb, and the meat of old goats is tougher and richer in taste. According to James Whistler, the founder of Cabrito and supplier of goat meat, goat meat is a dietary product rich with protein, phosphorus, sodium, potassium, minerals and vitamins. On 22-23 January 2019, National Association of sheep breeders in cooperation with OOO “Katumi” (Leningrad Region) held a seminar on sheep and beef cattle. The event was attended by: M. Egorov, Director-General, National Association of sheep breeders; T. Agapova, Deputy Chairman of the Committee for agriculture and fishery complex of Leningrad region; V. Sanjeev, Minister of agriculture of the Republic of Kalmykia; A. Chotchaev and A. Pozdnyakov, members of the Board of Directors of National Association of sheep breeders; S. Khattaev, leading researcher of the Federal State Scientific institution All-Russian research Institute of breeding; specialists of the regional agricultural administrative bodies of the Republic of Dagestan and the Karachay-Cherkess Republic, heads of agricultural enterprises of the Republics of Khakassia, Kalmykia, Dagestan, Karachaevo-Cherkessia; the Ivanovo and Yaroslavl regions. The seminar included breakout sessions: "Meat sheep breeding" and "Livestock breeding". Section session on meat sheep breeding was devoted to the presentation of the youngest in Russia sheep breed – katum. The presentation of the technology of keeping and feeding meat sheep, developed at the enterprise and the production laboratory for artificial insemination of sheep and technical devices, developed jointly by specialists of the agricultural enterprise "Katumy" and the scientific and technical center "Faraday", was held by the Director of the company O. Lebed and the leading specialist of the enterprise, candidate of veterinary Sciences, author of the katum sheep breed T. Dmitrieva. The farm traces its history back to 1992. Today it is difficult to imagine that the work began with the reconstruction of the road, cleaning of the spring and wetlands, construction of a house and a barn for animals, electrification, and equipment of an artesian well. 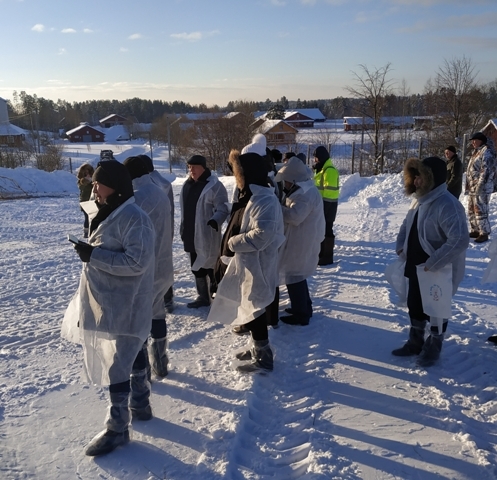 The participants of the seminar were surprised by animals, including young stock, under a canopy, as the temperature dropped to around minus twenty degrees Centigrade. The moderator of the section meeting T. Dmitrieva explained to the audience that the hair cover of animals is optimal for their thermoregulation, because the hair has a tubular (hollow inside) structure that retains heat in the winter cold and prevents overheating in the heat. 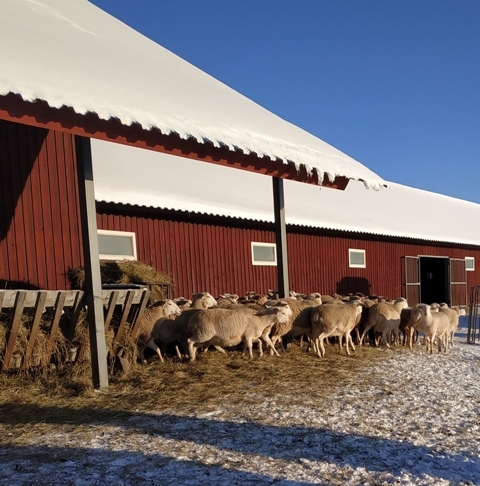 Hair cover mainly consists of hair, and only in the cold appears undercoat, which with the onset of warm time sheds, so the sheep do not require shearing. Sheep of katum breed weigh up to 110 kg, ewes - up to 80 kg. Animals are not subject to diseases of hooves, infectious and invasive diseases, have a high overall vitality. The breed is characterized by a high birth rate (220%, twins and triplets are the norm), high maternal qualities and sufficient amount of milk with the ewes. Lambs have high growth energy and gain weight quickly. Sheep, according to experts, are very quiet, obedient, and phlegmatic. As M. Egorov noted, this breed in the conditions of obvious deficiency and high demand for sheep of domestic meat breeds, certainly, is of interest for farmers, owners of personal farmsteads and small agricultural enterprises. Katum smooth-coated meat sheep are promising for breeding in the Volga, Central, Southern and North Caucasus Federal districts. The sales of pedigree cattle, according to M. Egorov, should be one of the main directions of activities "Katumi". To see and learn as much as possible about the breed, sign up for a queue for the purchase of breeding young (demand still exceeds supply) will be possible in May, 2019 at the 20th Russian exhibition of breeding sheep and goats in Astrakhan. The issues of the use of information and analytical systems "Selex" in sheep breeding, veterinary reports, information support of the Executive authorities of the regions were also considered during the event. After discussing the results of the seminar, the participants visited the largest organization of the North-Western region for the production of high - quality bioproducts - OOO "Nevskoye".